The AskAlanAQuestion.com Website. . . a resource for pool and spa help and informed shopping!!! Your Mobile-Friendly, Safe and Secure, Pool and Spa Connection, since 2002. Used with other sanitizers, to produce better water quality. Effective Part of Alternative Pool Water Sanitizing Systems. Scroll down to browse through some archived SWIMMING POOL questions and answers. Please click the Pool Problems Link, on top of every page, to access a complete listing of Pool Problem subjects, an alphabetized Website Table of Contents, Pool Equipment Information, About Alan Biographic Material and a Pool Glossary. Use the other links to access additional subject information. More information about some new and unique products, for pools and spas, can be found by visiting The Website Store. You'll never know what you'll find and that's always fun. Be better prepared and avoid costly problems! Shipping is FREE* . . . within the Continental U.S.
A $9.99 handling charge will apply to Continental U.S. Orders, under $75.00. Orders outside of the Continental U.S. may require some additional charge, based on quantity and destination. Most products can be shipped World-Wide. International and orders outside of Continental U.S. - see comments on the ordering pages. Major Credit Cards and PayPal. You DON'T have to join PayPal. On-line shopping since 2002 - Safe and Secure!!! Using an ozonator, to improve pool water quality!!! Ozone generators can be very useful in maintaining pool water quality, but they cannot be the only product being used to sanitize and maintain the pool. Ozone leaves the water very quickly, once the ozonator is turned off. This requires that a persistent sanitizer, such as chlorine or bromine be present. Chlorine is the most popular pool water sanitizers. Sanitizing is a must, for proper pool water management. Salt Chlorine generators are a better way to utilize chlorine, producing more controllable results. They eliminate the need to handle, measure or store chlorine products, while reducing buildup problems. An Electronic PockeTester Kit is a convenient way to monitor the salt level, as well the overall water chemistry. If you have a pool or spa water testing need, we should have the product. 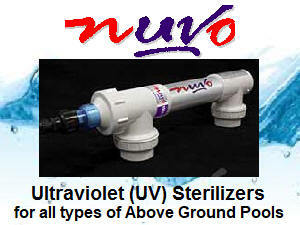 An Ultraviolet Pool Sterilizer kills 99.9% of the microorganisms, passing through the cell. It can kill sanitizer-resistant pathogens and is typically used with chlorine or bromine. A Solar-Powered, Dual-Ion, Pool Mineralizer uses copper and zinc ions, to help control algae and reduce overall chemical usage. A Solar UV Sanitizer creates "free radicals" to help improve water quality and reduce chemical usage. A ColorQ, all digital Water Tester can perform all of the common tests, while eliminating the color-matching and guesswork. With 10 models, performing up to 11 different test factors, one is right for every need. The Circulator is a replacement return jet fitting, that dramatically improves circulation, by creating a spiral return flow. Better circulation helps sanitizers work more effectively. The WaterLink SpinTouch Labs are the ultimate tester, doing up to 10 different water test factors, in just 1 minute. Voted product of the year. How to use Ozone, to help sanitize and maintain a pool? Ozone (O3) is a form of Oxygen (O2) and is a powerful oxidizing agent that can control microorganisms, destroy organic contamination, byproduct build ups, dead algae and organic debris. It is not a complete sanitizer in the truest sense, because it does not remain in the water for long periods of time. In a swimming pool, there must be a backup sanitizer such as, chlorine or bromine, usually at about 1/2 the normal level. Because the ozonator does most of the oxidizing, far less chlorine or bromine will be required to maintain any given level. Ozonators, also known as Ozone Generators, can greatly reduce the quantity of the backup sanitizer that would, otherwise, be required. This is especially important in larger pools, heavy bather usage situations and commercial pools. The devices that generate Ozone fall into two categories: UV or Corona discharge. Commercial pools, larger residential pools or heavy bather load pools should utilize a corona-discharge unit, as it is capable of producing larger amounts of ozone. With ozonation, the water chemistry should be maintained in the typical manner. Ozone generators can be even more effective, when used together with a salt chlorine generator. If problems arise, refer to the Pool Problems Page, as a source of problem-solving information, broken down into various categories. Scroll down the page and click on the linked keywords, catch phrases or images, in the archived answers below, to access additional information, on that topic or product. Join our E-Letter Mailing List. You'll receive 1-3 E-Letters a month, featuring helpful pool and spa advice, new product information and sale announcements. All we require is your e-mail address and you can opt out anytime you wish. ► Bubbles In The Return Flow? Hello, I have a new in ground pool and we have the o-zone generator installed. We have intermittent bubbling while the pump is working at the pool corner where is the return line located. Does the O-zone system produce that intermittent (every 2-3 seconds) bubbling? Thank you. A bubble stream is normal. Ozone is introduced, into the water, by air being sucked into the return flow. This effect is called a venturi. If you don't see bubbles, in the return flow, that indicates something is wrong. However, the presence of bubbles does not mean ozone is being produced. An ozonator is not a stand alone sanitizing system. It needs back up. It provides oxidation, without the addition of chemicals that lead to chemistry changes or buildup. Chlorine or salt chlorine generators can be used in conjunction with ozone, which makes it a complete sanitizing-oxidation system. Shock is only required, if the water water is deteriorating or, possibly, after heavy bather usage. Any kind of shock can be used. It is hard to completely eliminate chlorine. It is better to try and reduce the amount required and an ozonator should help you do that. When chlorine is being used in a back up role to ozonation, it is common to maintain the chlorine at about 1/2 the usual level. A salt chlorine generator would be a good choice, as it provides better control and results. Chlorine should be protected, by adding a one-time addition of cyanuric acid, usually around 50 PPM. The offensive odors, sometimes associated with chlorine, should be eliminated by the ozonator. Ozone leaves the water very quickly. You might consider adding THE CIRCULATOR. This easy to install device will create a spiraling return flow, that helps keep the ozone in the water, for a longer period of time. Helps to better distribute heat and chemicals and reduce filtration time. I hope that I have been helpful. If so, please tell your friends and dealers about the website. ► Ozone Doing It Well? Because the ozonator is doing much of the oxidation, less chlorine is being used up and that causes the level to build up. Cut back o n the number of tablets being used, as you do want the ozone to continue to do as much of the oxidation as possible. You can lower the pH, by adding acid. Lowering the CYA is another matter. It is rising, because of the use of trichlor tablets. At 150 PPM, you should replace water, in order to drop it under 75 PPM. High levels will make the chlorine less effective and make algae more likely. Adding a salt chlorine generator will allow you to use chlorine, without adding to the buildup of cyanuric acid. Having a mineral purifier also helps you cut back on chlorine usage and is another reason to cut back on the number of tablets. The Pool Circulator will help you achieve dramatically better circulation, which is important, in order to better disperse the sanitizing chemicals and ozone. I hope that the information provided was helpful. ► Ozone, Chlorine And ORP? I have a system with an ozone generator and a controller for pH and ORP on my swimming pool. I keep my pH at 7.5 and my ORP at 700. The one thing I have always been confused about is how long to run my filter pump. And what should the Chlorine level be? I've been told I can use almost no chlorine, if I run my system 24 hours a day. Presently I am maintaining a chlorine level of about 0.4 - 0.6 ppm and run my filter for 10 - 12 hours a day, usually for 12 hours during summer and when the pool is heated. I'd like to minimize chlorine usage. As I see it, it's a trade off between chemical usage, electricity for the pump and how much chlorine in the water I'm willing to deal with. Is my practice an acceptable one, or would you suggest otherwise? Thank you. You're right. It is a trade off. I suggest that you continue as you are doing. It is not a good idea to give up on the chlorine, as its presence acts as confirmation that proper sanitation exists. With the ozone generator, it will take little chlorine to maintain this lower than normal level. The big negative, about chlorine, is formation of odorous and irritating chloramines. In your pool, this is not a problem because the ozone destroys the chloramines. Chlorine acts as a persistent sanitizer and helps backup the ozone. You seem to have things well in hand. All I can suggest is that you operate the filter and ozonator for two sessions per day, by dividing the current running times in half. That way the pool will be without ozone being produced for fewer hours at a time. Better circulation will improve the chances of success. The Pool Circulator will help you achieve dramatically better circulation, which will significantly, better disperse the sanitizing chemicals and ozone. I hope that I have been helpful. I have a 26K gallon (100 cubic meter) pool, and currently installed is an Ozone Generator, which can produce 4 grams/hour ozone. I run my pool pump 8 hours per day and, yesterday, I measured the Ozone levels in my pool (right at the return line) with an Ozone Meter (quite a sophisticated and expensive Ozone meter using vials to break and vacuum and put in the test equipment) and the readings are astonishingly high at 2.8 to 3.1 ppm levels. At this point am I endangering the health of my family and the guests? Can you please help and let me know what product would be better to install, from your site, and what is the actual Ozone readings I should have from the pool water? Thanks for your prompt reply. It is entirely normal for the ozone readings to be high, right at the return. It drops very quickly. as the water mixes with pool w ater. At the other end of the pool, you will probably find zero. Ozone leaves the water very quickly, once the pump is off. To help the ozone disperse better and reach more of the pool, I suggest adding The Pool Circulator. Instead of having just a stream moving straight ahead, it will create a spiraling return flow, that will better disperse the ozone and allow it to reach more of the pool and perform better, as well. Still, ozone alone is not enough, to assure proper sanitizing, as it leaves the water too quickly. For this reason adding a salt chlorine generator can add persistent sanitizing, while using a much lower level of free chlorine to achieve optimum results. There should be little or no odor of chlorine, because of the ozone. I hope that this information will prove helpful. ► Ozone: how does it work? How do pool Ozonators work? Will other chemicals and chlorine still be required? Thanks for the help. Sincerely. There are two common methods of generating ozone in a pool. Most units pass air over a UV light source, that converts oxygen into ozone. Others units use corona discharge (electric sparking similar to lightning) to convert oxygen into ozone. The corona discharge units can produce highe r quantities of ozone, but can generate unwanted nitrous oxides. In a swimming pool, the ozone can destroy organic matter, including algae and bacteria. An Ozonator generates very high levels of ozone, using a much safer UV light source. The Ozone Generator is usually operated in conjunction with the timer and the filter. Once the Ozonator is shut off, all production of ozone ceases and the ozone in the water quickly leaves - there is no residual effect. At this point, the pool is subject to microbial growth, especially on the walls and in the corners. Because of this limitation of ozone, there must be a backup sanitizer, most often chlorine or bromine. However, the Ozonator will very dramatically reduce the amount of chlorine or bromine required, to a fraction of what it would be, otherwise. You can use a salt chlorine generator to produce any chlorine, that might be needed, to maintain this lower than normal level. So far as the overall water chemistry is concerned, it must be maintained in consideration of water clarity and quality, bather comfort and corrosiveness. I hope that I have been of assistance. Alan-we have a new indoor pool and are having trouble keeping the chlorine level down. The pool is used primarily by one swimmer, and is covered around 23 hours per day. We’ve been using a dichlor shock treatment once a week per instructions. I’ve shut our chlorinator (which uses 3” tablets) off entirely. With the chlorinator off for more than one week now, and with a shock per above one day ago, our readings are total chlorine (between 3 and 10), free chlorine (10+), with pH, total alkalinity, and stabilizer at normal levels. When the cover comes off, there is a definite chlorine odor. The pool has an ozone generator and a floating mineral sanitizer. I suspect that with no sunshine burn off, and limited bather use, there is limited consumption of chlorine. Is the solution to not shock and dribble in very little chlorine, or shock using less shock product? We’re literally itching for an answer! Thanks! I can see from your email address why the pool is indoors. I do have an answer for you, but it may not, entirely, be the one you expect. Stop adding all chlorine: either in the form of tablets or shock! Your pool is equipped with an ozonator and a Mineral Sanitizer, is located indoors, is covered most of the time and not subject to high bather loads. This means that the ozonator and the mineral sanitizer should be more than capable of meeting most of your pool's sanitizer requirements. The chlorine levels are building up because there is little for them to react with - just as you might have suspected. The recommendations for chlorination and shocking were probably made based on the pool NOT being equipped with an ozonator and mineral sanitizer. The only time you will ever need to shock the pool is at the first sign of a loss of water quality or after periods of heavy bather usage. Under these circumstances use a full strength chlorine or non-chlorine shock. The equipment that you have is what I frequently recommend to pool owners that are sensitive to either chlorine or bromine. I hope that this will solve the problem. Look at these interesting products!!! Limited-Time-Only Savings on some items. All major credit cards and PayPal are accepted. Shop with Security and Safety. Protected on a secure server, with SSL encryption. Visit The Website Store for more unique and problem-solving products. ► Why Aren't Ozonators More Popular? Ozonators sound like a good idea. So why are they not very popular? Is it good for a lazy pool owner? They may not be as popular as chlorine, but their popularity is increasing in all types of residential and commercial pools. The us e of ozone generators has been widespread in spas for many years. Ozonators are not complete stand alone pool sanitizers. A backup system, usually chlorine or bromine must be used. A salt chlorine generator can be used in conjunction with an ozonator and will provide additional benefits. Mineral sanitizers and ionizers can also be used in conjunction with ozone and chlorine, to provide backup sanitizing and reduce the chlorine usage. In addition, all of the important water chemistry parameters must be maintained, as in a chlorine-maintained pool. Yes, it is convenient. Yes, it will reduce the overall requirements for sanitizer and will simplify chemical balancing. Yes, it is good for "lazy" pool owners. There are other choices that might be worthy of your consideration. 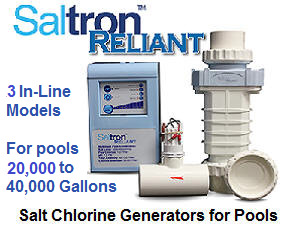 Salt chlorine generators can completely eliminate the need for any chlorine and there is no need for a backup. Still the water chemistry must be maintained. But isn't that what pool service companies are for? I hope that I have been of assistance. ► Ozone Is Not Always Enough? I have a 40000 liter above ground therapy pool. This means it is kept at 94 deg. at all times and that only 2 people are in the water at a time. The pool is lined with a thick PVC liner, n a closed enclosure and covered during the night. The filter is a 3/4 HP with zeolite filter. It runs 24/7circulating all the water every3 hours. Sanitation is ozone only- a GDS process with a side stream injection and contact tank. Ozone generator is controlled by an inline ORP controller, measuring water returning from the pool and keeping them at 680-780 mv. Pool pH is kept around 7.3. 6 months ago I enlarged my pool (took it apart and added new segments. All above data is post op.) Ever since then, the walls of the new segments, lined with the same kind of liner, are becoming slimy slippery. I have been scrubbing it off every week and it just keeps coming back. I have tried super-chlorinating, which seems to keep it clean for 3-4 days, but then its back .if I let it be it eventually spreads to the 'old' parts of the pool. Could it have something to do with ozone-zeolite reaction? Could ozone be sucking plasticizers out of the liner( and still doing it after 6 month's). I will be glad to add any more info you need to speculate this. Tnx. There is no mystery here!!! Ozone generators are good additions to any pool, spa or therapy pool. While they do a great job at reducing the biological loads and waste products, they cannot be used alone and achieve proper results. Ozone does not remain in the water very long and will be unable to prevent the growth of algal or bacterial slimes on the walls or in the corners. To keep all of the underwater surfaces free of microorganism growth, it is mandatory to use a sanitizer such as chlorine or bromine. Because the ozone generator will be doing most of the oxidation, the amount of chlorine required, to maintain any given level, will be greatly reduced. In other words, you still should be maintaining at least a low level of chlorine or bromine and, to do so, it will require less chemical, than if the ozone generator was not present. Chlorine and bromine are persistent sanitizers and having the ozonator present, allows their use to focus on sanitizing. When the ozone generator is off, the chlorine or bromine will still be present to sanitize and oxidize. Adding a Solar-Powered Dual-Ion Mineralizer adds another layer of persistent sanitation and helps you maintain proper conditions, while favoring the low end of the recommended chlorine or bromine range. No mention of chlorine use was mentioned in your letter, except to help clean up the microorganism growth. If you were not directed to add and maintain a chlorine or bromine level, you were ill-informed or mislead. Just an ORP Test is not enough. If you add a salt chlorine generator, it will provide backup sanitation, while using less chlorine, than a pool without an ozonator. Zeolite has to be regenerated periodically, with the addition of a salt solution, to the filter tank. Having a salt chlorine generator completely eliminates the need to regenerate, because of the salt content of the pool water. The high operating temperature only adds to the problem. The zeolite is not part of this problem. At this point, you need to shock the pool and get a stable free chlorine level and all traces of slime removed. From this point forward, try to maintain a free chlorine level of 1-2 PPM or a bromine level of 2-4 PPM, while operating the ozone generator for as much time, as practical. I hope that this information will be helpful. After reading more of your advise to others, I am wondering if we could get away with using NO chlorine by using an ozonator along with a mineral pac or an ionizer. We are getting a small (3,600 gals.) fiberglass pool which will be covered with a 4" spa cover, and will also be under a patio cover, used by 2 adults. We plan to keep the pool at 87-90 degrees. What would you recommend? Would our filter (sand) have to run longer if we do not use chlorine or a salt chlorinator? What other additives/tests would we need to use, and would we have to be extra careful to add fresh water, because of the pool being covered all the time? Is it smarter to just go with a salt chlorinator? Our pool installer is discouraging us from use the salt chlorinator, and if indeed we can get by with no chlorine, that would be ideal. However, we want to keep things simple as well as clean, and safe. I'm obviously in the dark about pool chemistry and appreciate any insight that you can offer. Thanks. What you are proposing will work. Just make sure that the ozonator is properly sized for your pool. The combination of an ozone generator and a Solar-Powered Dual-Ion Purifier-Mineralizer will work well, even at higher temperatures, as this combination is popular in spas. For the sake of bather comfort and water quality, the overall pool water chemistry must be maintained in the typical manner. This combination should not require filtration practices that are different from typical pools of the same size and configuration. 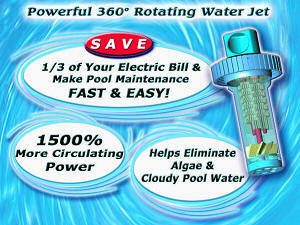 By adding The Pool Circulator, you will dramatically improve circulation and eliminate dead zones. This makes it possible to send ozone to the four corners of the pool, achieving optimum performance. Another means of minimizing chemical usage is with ultraviolet sanitizing. Adding an Ultraviolet Sterilizer will allow you to use as much as 70% less chlorine or bromine, killing virtually all of the microorganisms, as the water flows through the unit. I would still advise the use of a low level of chlorine, as it confirm that proper conditions exist. All it should take is a 0.5-1.5 PPM level. There is be little sensation of chlorine and the amount used, to maintain this level, will be much less. You may not eliminate chlorine, but you will come close. I hope that this information will prove to be helpful. Please tell your friends and dealers about the website. ► Bromine Usage and Ozone? I have a 25K gallon in ground pool that uses bromine for sanitation. We have had the pool for 9 years and it is 15 years old currently. It has been relatively easy to maintain. My question is that with bromine, we have to shock the pool almost every other day in the peak of summer when it is used a lot and the water temp is up around 80. I am assuming that this is because bromine is un-stabilized and degrades quickly from the Sun. So the real question is what type of auto generating systems can we add to this pool to ease the high volume of shocking? Looking at Ozonators, Salt Generators, etc, but find very little info when it comes to supporting a bromine system. Thanks for your help. This is a good question and you are wise to ask it. Even if you stop using bromine, bromide ions will remain. Adding chlorine will convert the bromides to bromine and the process keeps recycling. If you add a salt chlorine generator, it will have to be set at a higher than normal setting and this will shorten the life of the cell and create more of a pH rise. Many salt chlorine generator manufacturers do not recommend having bromides present. An ozone generator is not a stand alone sanitizing system. It needs back up. It provides oxidation without the addition of chemicals that lead to chemistry changes or buildup. If you use an ozone generator, it will carry the burden of the oxidations or wastes and organic byproducts. That leaves the bromine for sanitizing and backup. Under these circumstances, you will need far less bromine and should be able to set the goal at a lower 1-2 PPM level. Because bromides are present, you can use the less expensive chlorine to maintain the low bromine level, as it will be converted. Adding a Solar-Powered Mineralizer, which can be used with bromine and ozone, will provide persistent backup and help minimize bromine or chlorine use. I hope that this information will prove to be helpful. ► Ozone And A Salt Chlorinator? I live in Venezuela and we live in the mountains where is cool and we have a pool of about 41,000 gallons that is currently heated to about 90 degrees and this is forcing us to increase our chemical usage. The kids eyes are being affected. I would like to move towards using less chemicals and would like to get a ozone generator and/or combination of a salt chlorinator. Could you recommend something? The combination of a salt chlorine generator and an ozone generator should be a great improvement. While a combination unit does exist, I would not recommend it. Your pool is quite large and the temperature will be on the high end. You should have full sized or even oversized units. For a salt chlorine generator that will do the job properly, I suggest an in-line model. The ozonator will provide backup oxidation and help minimize the amount of chlorine required. This will create more pleasant conditions and help the extend the life of the salt cell. I hope that this information proves helpful. ► How Long Do Ozonators Last? I have an ozonator on my pool and use trichlor, as well. It has made a major improvement and has decreased the chlorine needed to maintain a satisfactory. I know eventually I will have to replace a part, but how will I know? Thanks. The ozone generator will require a replacement part of bulb, depending upon the type of unit. You should get 2-3 years, before needing a replacement part. There are ORP PockeTesters, that you can use, right at the return, to confirm the presence of a proper ORP. If you ever notice a decrease in water quality, while maintaining proper chlorine readings, or if the amount of chlorine needed to maintain a satisfactory has become much higher, it suggests a replacement item is needed. I am glad to see that you appreciate the benefits of using ozone and chlorine together. Using less trichlor slows up the rise in the cyanuric acid concentration and makes the pH more stable, for longer periods of time. I hope that this information id helpful. ► Hydrogen Peroxide As A Backup? I read some of the information on your website regarding using ozone in a pool with a sanitizer like chlorine, bromine, ionizers, or mineral sanitizers, but I was wondering couldn't you also use hydrogen peroxide as a residual sanitizer? Any additional information you could provide on this would be greatly appreciated. Thanks. Hydrogen peroxide is not used as a pool water sanitizer. It is used only as an oxidizer, primarily with biguanide maintained pools. Biguanide acts as a sanitizer and hydrogen peroxide acts as an oxidizer and not as a sanitizer. With an ozonator, you don't need an additional oxidizer, as ozone amply fills that need. What you do need is a permanent backup sanitizer and, in this role, chlorine, bromine, Solar-Powered Dual-Ion Purifiers-Mineralizers or salt chlorine generators can be used. This way, if ozone is not being produced, for a short period of time, there will still be some sanitizer present. I hope that this information proves helpful. ► Protecting The Vinyl Liner? I have been investigating ozone systems and it I have read that ozone bubbles that get in the pool may cause vinyl liner color fading If the water flow at the return nozzles are directed straight out into the pool, do you think there will still be a problem with liner fading in your experience? I have been talking to a leading manufacturer about this, but I don't think they want to commit to whether or not I will have a problem. Not wanting to answer the question would hardly instill confidence in me. WHAT FADES VINYL LINERS IS DIRECT CONTACT OF CHLORINE PRODUCTS OR VERY HIGH LEVELS, OVER A LONG PERIOD OF TIME. Ozone does not remain in the water for very long. In truth, most of the ozonation benefit happens in the return pipes of shortly thereafter. That is why it is suggested that chlorine or bromine be used in conjunction with ozone, in order to provide persistent sanitation and oxidation. It will help you get by with less chlorine or bromine, to maintain any given level and that will help preserve the liner's appearance. Adding The Pool Circulator will help to better distribute the ozone, by boosting circulation and improving distribution. I hope that this information will prove helpful. Visit The Website Stores . . . for better informed shopping!!! Aqualab Systems, LLC does not make any warranty or representation, either expressed or implied, regarding the accuracy or completeness of the information provided by this website; nor does Aqualab Systems., Inc. assume any liability of any kind whatsoever related to, or resulting from, any use or reliance on this information. The content of this website should not be used, if it is conflict with any applicable federal, state or local regulations or guidelines.